Last week, I provided the fundamental background for why I believe the risk of lower lows in Gold remains, based primarily on USD/CNY breaking the critical 7 threshold. I also provided the rationale for the enormous rally to follow, driven by a reversal in policy by the Fed following a stock market crash and the subsequent ultimate peak in the dollar, including USD/CNY. This week, let’s take a look at the technicals, sentiment, and positioning in Gold to see if it counters or complements the fundamental thesis. Gold is currently heading higher in a bearish flag pattern. 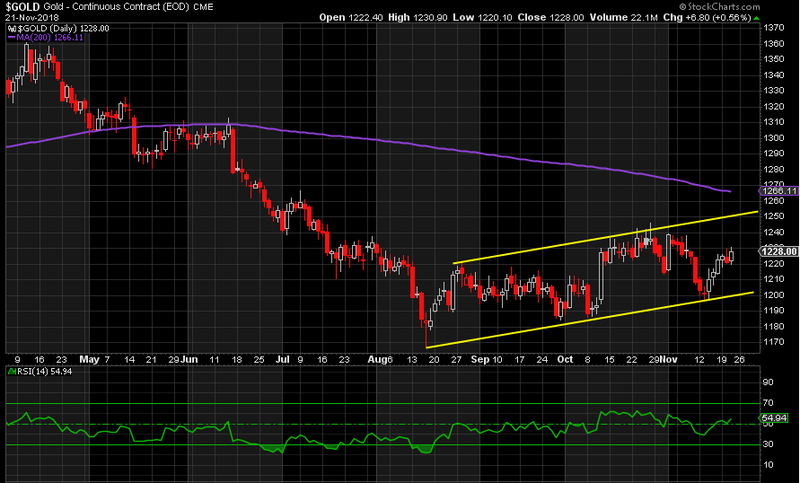 It could continue higher to resistance between 1251-1255 before heading lower again. Support is at 1200, also the previous closing low. A break down could open up a move down to 1184, 1160, or even 1124 next. 1251 is the key resistance area on the upside. It is the 38.2% retracement of the closing peak at 1360 in April and the closing low of 1184 in August. It is also the 50% retracement of the decline from the peak at 1377 in July 2016 and the December 2016 low of 1124. We have to take out 1251 in order to become any way bullish. Then there is the 200-day moving average, at 1266 currently. A level watched closely by the Bullion Banks and the Algos. Through there, and the path back to new highs since 2016 becomes clearer. The spot DSI (Daily Sentiment Index) hit a low of 6 in August, the same day it reached a low of 1167 on an intraday basis. It has since hit a double low of 7 on November 12 and 13, when Gold tested 1200 support and held. It has been rising since and now sits at 25. The 21-day moving average (“21D MA”) is also trending higher, setting higher highs and higher lows since August. It is currently at 22.5. The low in August was 10.9, its lowest level since December 2016, when the price reached 1124. In order to feel comfortable that Gold has truly bottomed from a sentiment perspective, I would ideally like to see a positively divergent lower low in price. Put simply, a lower closing low below the 1184 close in August at the same time that the 21D MA is above 10.9, somewhere in the teens. This would be ideal for a truly sustainable bottom in Gold from which we see a significant rally higher. We saw the same scenario play out between August 2015 (21D MA = 12) and early January 2016 (14), from which it rallied to the July 2016 highs. Should this occur again, I believe we rally to new highs above the 1377 high. This doesn’t have to happen for Gold to rally, but until then there is still a risk of lower lows in Gold, in my opinion. Money Managers (“Funds”) are what I call “price chasers”. When the price is falling, they load up short. When it is rising, they race to add long positions. In other words, they are extreme short at the lows and extreme long at the peaks. This is why they are commonly called the “dumb money”, extremely wrong at peaks and troughs. 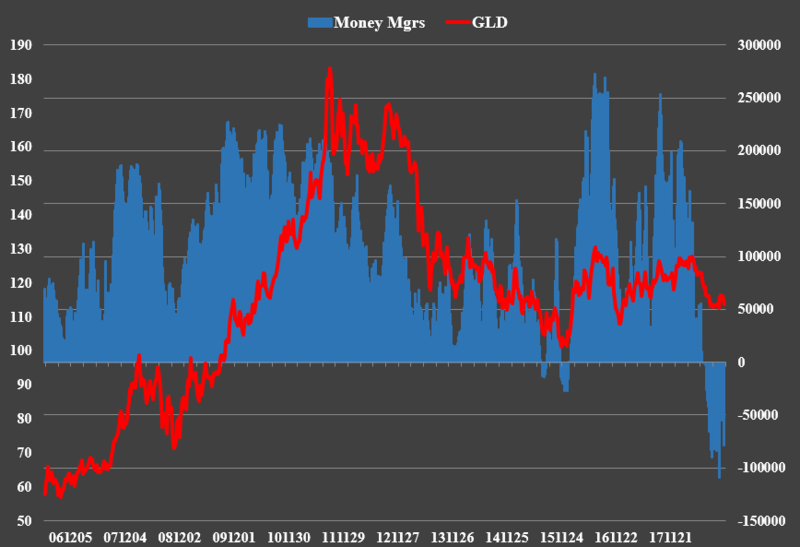 Funds raced to get short again as Gold fell to 1200 recently, only to get taken to the cleaners again by the smart money Commercials, specifically the Bullion Banks, which slashed their shorts prior to the ensuing rally. The data above is dated as of Tuesday, November 13. Given the rally since, Funds are likely less short now but still at historical high levels, as can be seen in the chart below going back to 2006, when this data first became available. Meanwhile, the Commercials have likely increased their long position again, but remain at historically low levels. 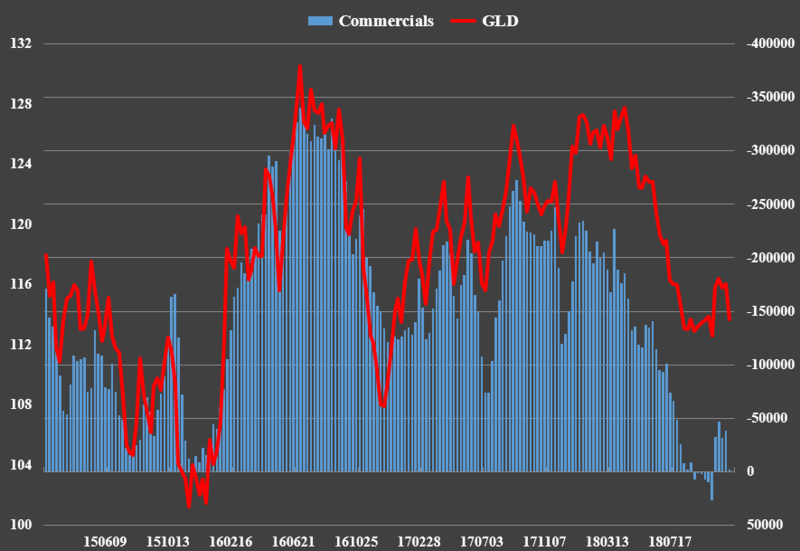 So the big question is: why isn’t Gold rallying to a greater degree already, given such extreme positions held by both the Funds and Commercials? The influence of China on Gold since April is the primary reason, but considering this solely from a positioning perspective, I still believe we may be seeing a repeat of late 2015. What I mean by this is that Funds were record short in July that year, when the price hit a low of 1072—its lowest price since February 2010. This was followed by a sizeable rally to 1191 in October that year, only to fall to a lower and final low in December, when the price reached 1045. Funds were holding even greater shorts at this point, a new record low. The dumb money was wrong at the worst time yet again, and Gold proceeded to have one of its biggest rallies in history over the next seven months. What if this is now playing out again? 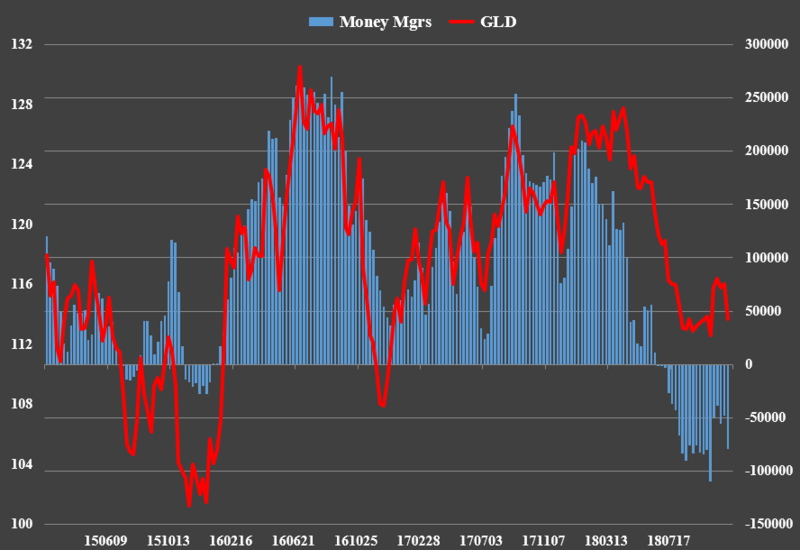 Funds held a new record net short position on October 9, when Gold retested its closing low of 1184 in August. Then Gold rallied to 1246, as that short position was cut by 65% in two weeks, similarly to October 2015. We may need to see another record short position this time around before the final low is in place, just as in December 2015. Given the size of the short position on October 9, this would have to be a truly gargantuan level of shorts. This scenario also means lower lows for Gold prices, just as December 2015. This makes sense given that it sets us up for a massive rally to follow. It also marries well with the ideal scenario for a bottom based on sentiment, specifically the 21D MA, and a positively divergent lower low. 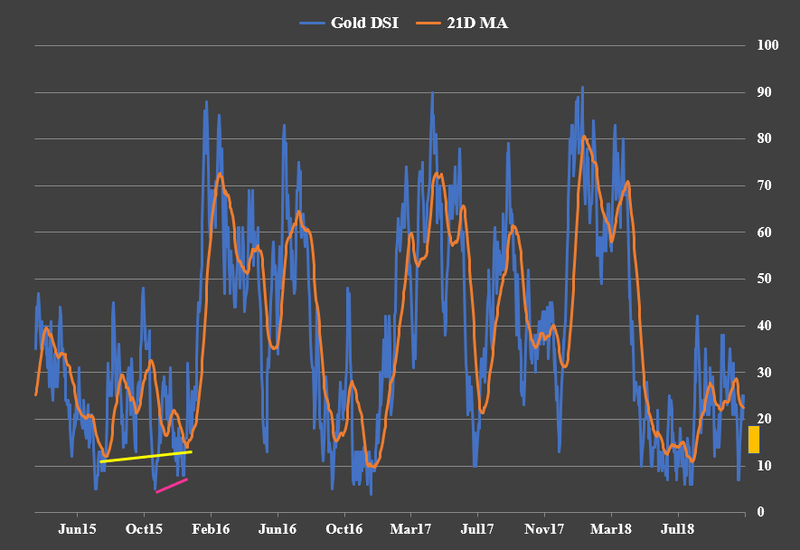 Taken together with likely oversold yet positively divergent technicals, this also matches the fundamental thesis provided last week and would provide the perfect combination for what I believe will be the most spectacular rally in Gold ever seen, eclipsing that in the first half of 2016. The views and opinions expressed in this material are those of the author as of the publication date, are subject to change and may not necessarily reflect the opinions of Sprott Money Ltd. Sprott Money does not guarantee the accuracy, completeness, timeliness and reliability of the information or any results from its use. You may copy, link to or quote from the above for your use only, provided that proper attribution to the author and source is given and you do not modify the content. Click Here to read our Article Syndication Policy. In 2016, he created GlobalProTraders.com, an interactive online community for traders to share their views on financial markets.